See San Marcos Pass case study. Shared-responsibility services that allow you to prepare your site with us handling such aspects as electronic tuning, testing, product installation, FCC-required documentation, staff training and custom materials. See the "Typical Shared-Responsibility Customer Involvement" paragraph below. Turnkey services in which we handle everything. In either scenario, we provide an illustrated instruction manual with every system purchased; and we have a network of reps strategically located across the USA to help you onsite if needed. Typical Shared-Responsibility Customer Involvement . 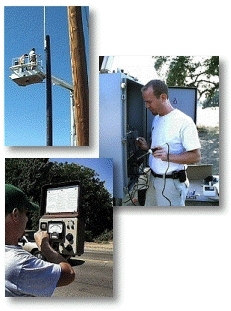 . .
You and/or your subcontractor physically prepare the transmitter/antenna site, including antenna support installation (wood pole or provided antenna stand), provided cabinet, coaxial cable and preassembled groundplane (see our Groundplane TechTalk webpage) as well as power and telephone services into the cabinet. To facilitate installation and tuning electronic components, you also provide access to any pre-shipped components and to the transmitter and antenna locations. Depending upon the style of the installation, excavation work, conduit and electrical service components (such as circuit breakers, meters or fuses) and access devices (such as a ladder or bucket truck) may be included.